Drs. 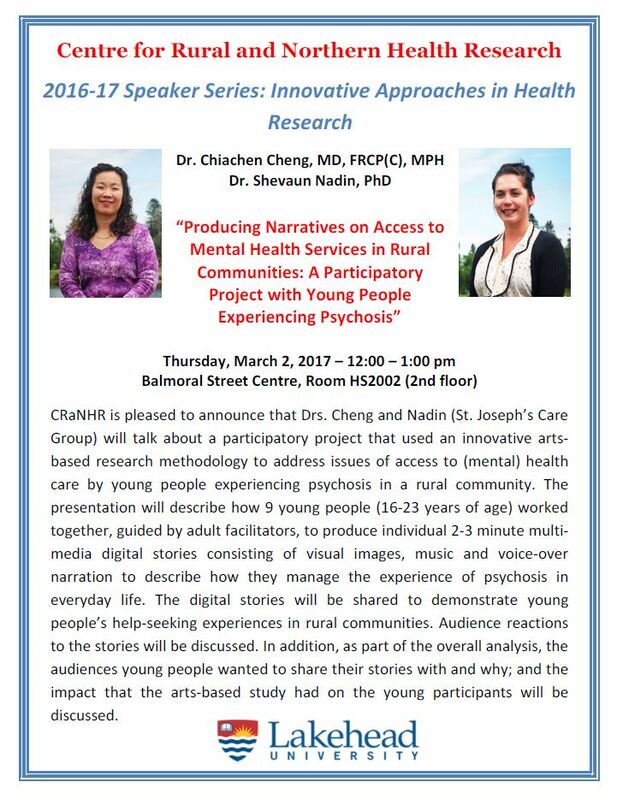 Chiachen Cheng and Shevaun Nadin will be presenting findings from the Digital Storytelling project at the Centre for Rural and Northern Health Research (CraNHR) 2016-17 Speaker Series: Innovative Approaches in Health Research at Lakehead University on March 2, 2017. CRaNHR is pleased to announce that Drs. Cheng and Nadin (St. Joseph’s Care Group) will talk about a participatory project that used an innovative arts based research methodology to address issues of access to (mental) health care by young people experiencing psychosis in a rural community. The presentation will describe how 9 young people (16-23 years) worked together, guided by adult facilitators, to produce individual 2-3 minute multimedia digital stories consisting of visual images, music and voice-over narration to describe how they manage the experience of psychosis in everyday life. The digital stories will be shared to demonstrate young people’s help-seeking experiences in rural communities. Audience reactions to the stories will be discussed. In addition, as part of the overall analysis, the audiences young people wanted to share their stories with and why; and the impact that the arts-based study had on the young participants will be discussed. The Northern Health Human Resources Research Unit was founded in 1992 by the Ontario Ministry of Health and Long-Term Care as a health-system linked research unit with sites at Lakehead and Laurentian. In 1997, the mandate was expanded and the centre renamed to the Centre for Rural and Northern Health Research (CRaNHR). In 2013, CRaNHR at Lakehead University became an autonomous and independently-funded research centre, continuing its established program of research into rural, northern and Indigenous health issues. Our objectives are to contribute to existing knowledge on rural, northern and Indigenous health and provide evidence that supports policy makers, planners and decision-makers in understanding health services delivery; documenting health status and determinants of health; and exploring factors that facilitate or impede access to socially just health care. Additionally, our work addresses education, recruitment and retention of health professionals and paraprofessionals. Supported by peer-reviewed research grants and contracts, our staff works with an interdisciplinary core group of investigators across four faculties at Lakehead to provide high level quantitative and qualitative research into determinants of rural and northern health. We also conduct evaluative research on health services, programs and policies for provincial and federal agencies, health care organizations, and Indigenous communities. We also provide opportunities for both undergraduate and graduate student mentoring and training, with a focus on “hands on” research experience and community engagement. This entry was posted in Knowledge Translation and Exchange and tagged Academia, Canadian KTE, CRaNHR, Lakehead University, Northern Ontario KTE. Bookmark the permalink.